Ever since my passion to write went into addictive levels, I almost shut my eyes except for essential news developments as evening capsule. Resultantly, 26th November has gone unnoticed as National Milk Day was celebrated in memory of Dr. Verghese Kurien, Father of India's White Revolution. 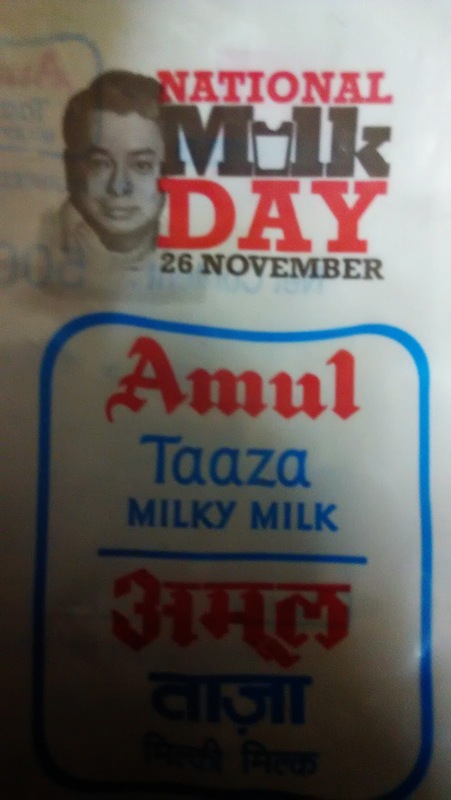 The significance of the day was realized only in the late evening when I bought an Amul milk packet on which Dr. Kurien's photo was printed with a caption " National Milk Day 26 November' which you are seeing on the right side. Dr. Kurien is long remembered as Amul's Founder, the flagship brand of Gujarat Co-operative Milk Marketing Federation. In fact June 1 is annually celebrated as World Milk Day after the day was designated by UN's Food and Agriculture Organisation to propagate the importance of dairy products in our lives. But in India, 26th November was mooted as it was birthday of Dr. Kurien whose contribution the country can't forget. As a tribute, Amul carried National Milk Day's logo with Dr. Kurien photo for its 200 lakh milk pouches for a week time through out the country. One last word about 26th November this year. It was also a notable day in my personal life as I started another blog called " Wisdom Everest " click here to go http://wisdomeverest.blogspot.in/ with a lofty mission to enrich myself with the wisdom of Great Masters.